At first I didn’t want to see any Muay Thai matches. I’m not a big fan of violence, especially needless violence done for the entertainment of others. But Muay Thai is a part of Thai culture and I’m here to learn about Thai culture. So I went with Mark and Taryn to see a fight. It wasn’t quite what I expected. There was an image in my head of two blood thirsty men wailing on and kicking each other in the face relentlessly; not stopping until blood poured out of one or the other’s head like a faucet. Maybe one or two fighters would cheat and try to get in a few cheap punches. Curses and insults would be yelled out at the fighter from their opponents’ fans. In the worst case scenario, one coach might sneak poison into the water bottle of the other fighter. After each fight and some rounds, Taryn noticed that they seemed to be joking with each other. My guess is that they probably all train together and have been doing so for years. They might have all been friends and fighting comrades since childhood. For the record, there was only one bloody nose. The boxer managed to stop the bleeding and was able to get on with the fight. 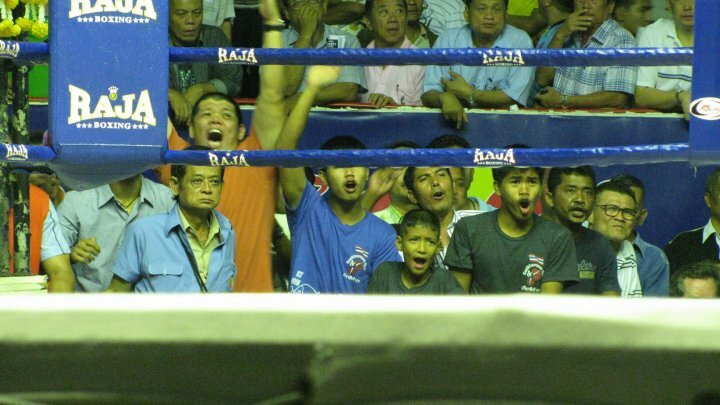 The most entertaining part of a Muay Thai match is the coaches and trainers… and whatever fan or passerby that wanted to animatedly give his or her two cents. 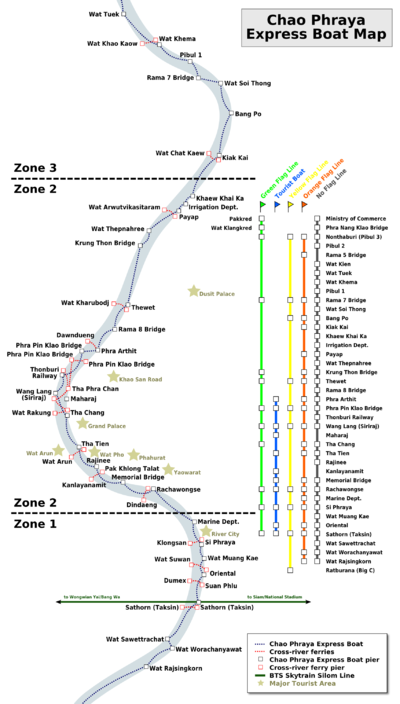 Go to the Sala Daeng BTS Station or Silom MRT station. That will put you in the eastern end of the street. If you go to the Saphan Taksin BTS Station then go north on Charoen Krung (ถนนเจริญกรุง) you will run into the western end of Silom road. Silom is a street that goes through the tourist area of Bangkok, one of the many districts in Bangkok. 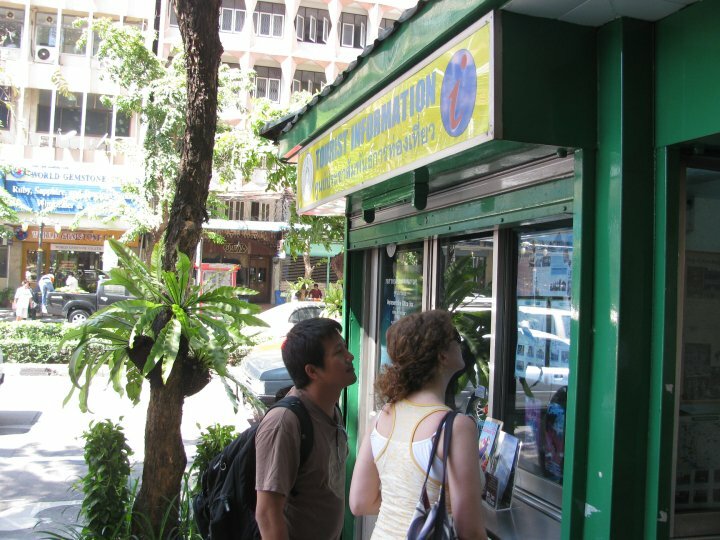 If you walk the length Silom street, you will find all the backpackers in Bangkok, well most of them at least. Along Silom road there are many swanky shops and hotels. The hostels are on intersecting streets and alleys. Take a boat and ask for N1. Head west to the end of the street. When you come to the end of the street make a right on Charoen Krung (ถนนเจริญกรุง). This would mean that you are now heading northish. Then turn left on Soi Charoen Krung 40. It is the first street that goes all the way to the river. Very cheap. Normally about 12-30THB for a ride. Riding the ferry is a very cheap and easy way to go short distances near central Bangkok. It’s not that great, however, during rush hour or for very long distances. Go to Phra Athit (N13) Pier. You cannot enter the fort. You can only look at it from the outside. Always available. You cannot enter the fort. You can only look at it from the outside. 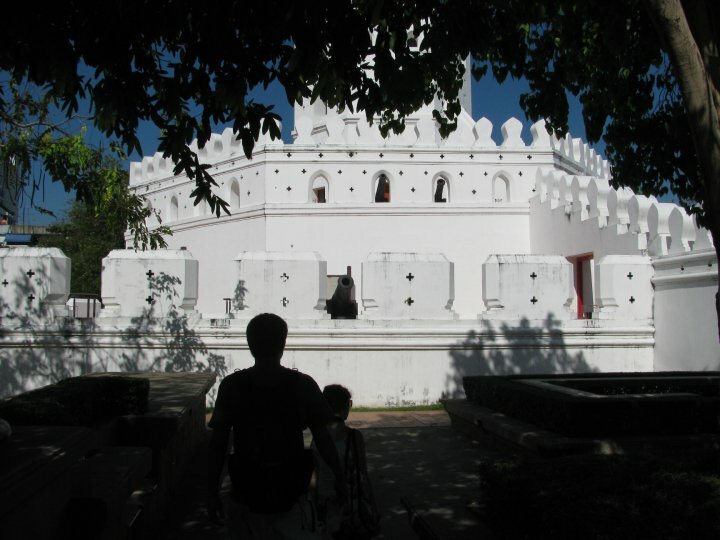 This fort was built back in 1783 during the reign of King Rama I. There isn’t much to do here but walk by and look at it, since it seems to be closed to the public. 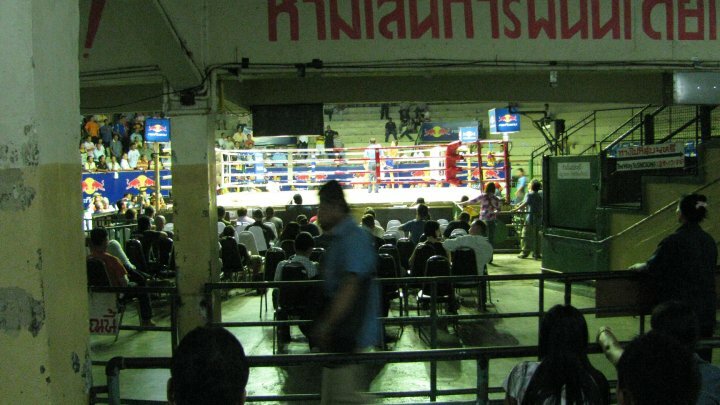 There are many stadiums in which to view Muay Thai. We went to Rajadamnern Stadium (สนามมวยราชดำเนิน), but if we were patient we could had seen a fight for free. Channel 7 Stadium (free admission) – I don’t have much information about this, but you might have to stand. When you go to buy tickets, if you’re not getting free ones, someone will tell you that the price is double because tonight is the championship match. They might also say that tonight is the last fight of the season. This is utter nonsense. There is always some match going on. Besides what do you care whether you see a champion fight or some semi-pro sparring? 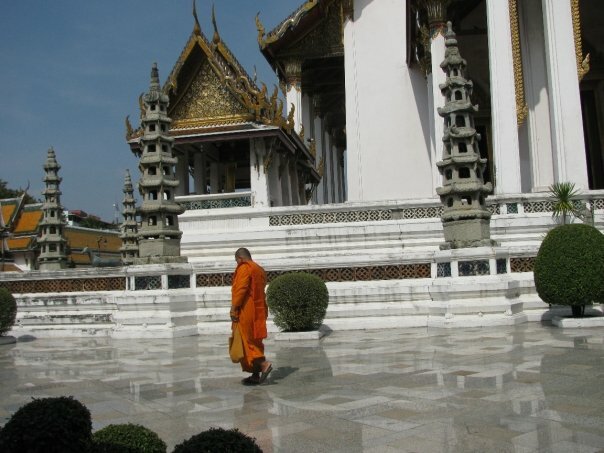 There are some travel agencies that will sell you tickets for the 1,000 (3rd class) – 2,000 (ring-side) THB. If you cannot find any of them* then go to the Holiday Inn on Silom and buy your tickets there. It is more expensive, but for the same price as being cheated, you get a free limo ride to stadium and then back to the Holiday Inn. Personally I prefer to watch the kids fight. There is almost no blood when kids fight. *We found one completely accidentally when we got lost and I have no idea where it is.